Everyone loves a trip to the beach. The warmth of the Sun on your skin, the fresh air blowing off the sea, the soft sand between your toes, the glowing waves, the chunks of ice, and the hot springs are what make a holiday special. You probably weren’t expecting to read some of the items in that last sentence, but not all beaches are the same. Some have very unique qualities. 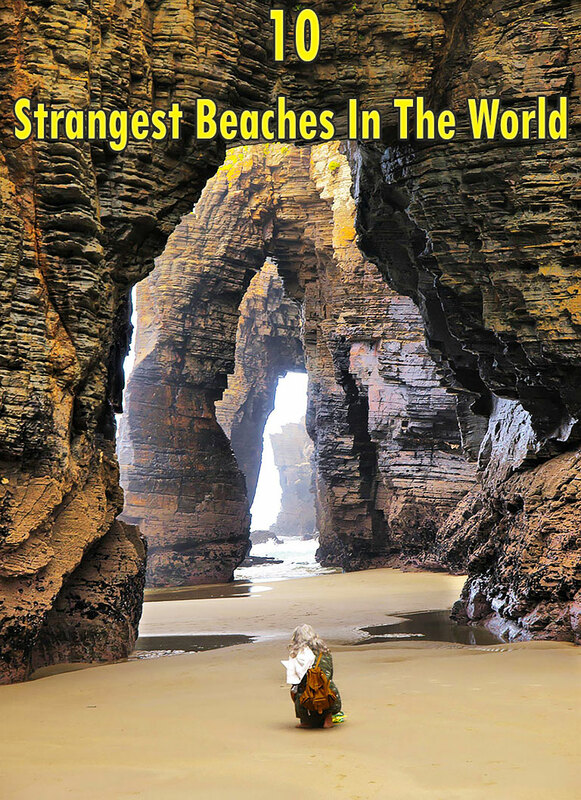 Here are ten strangest beaches on Earth to plan your next holiday around. Algar de Benagil in Portugal is one of the highlights of the Algarve coast. Someone walking by on the cliffs above might notice the hiss and rush of waves but not know where the sound is coming from. Getting closer, they will see a fence which surrounds a gaping hole. Only if they peer down into the hole will they see the hidden beach beneath. Algar de Benagil is a natural grotto worn into the rock of the cliffs by the action of the tides. In the arched space left behind, a beach has formed. The hole in the roof of the cave acts as an oculus which lets daylight in to the secluded, sandy beach. Since the only access to the grotto is from the sea, you’ll have to brave the waves to enter between the rocks which guard the entrance if you want to visit. Iceland is a volcanic island in the North Atlantic. Because it is made of volcanic rock, it has many beaches which reflect the color of the rock they are worn from. Black sand can be found in many places. Jokulsarlon Glacier Lagoon is different; here, the black sands are dotted with chunks of diamond-clear glacial ice. Jokulsarlon Glacier Lagoon is attached to the sea by Iceland’s shortest river, a mere 1,500 meters (4,900 ft) long. The beach may look ancient and otherworldly, but it only formed in the mid-1930s as the glacier Breioamerkurjokull retreated. It is from the glacier that the brilliant lumps of ice on the beach come. The lagoon is still growing, and growing faster each year, as the glacier melts. The black sand of the beach is what remains of the volcanic rocks, pulverized under the immense weight of the glacier. Why do you take a bucket and spade to the beach? Most people would say to build sandcastles. In one area of New Zealand, you might get a very different answer. On the Coromandel Peninsula, people will say that they need them to dig their own hot water spa. Hot Water Beach has one of the most literal geographic names in the world. When the tide goes out, water can be seen bubbling up from the sand. This water is hot. An underground river is warmed by geothermal heat that comes close to the surface here. As soon as the tide is out, visitors flock to the sand, some with spades which can be rented from a local cafe, and begin digging pools. The cold seawater retreats, and the pools fill with the hot water that gives the beach its name. Here, beachgoers can wallow in the natural spas. Then the tide comes in and washes all the pools away, leaving the beach flat for the next batch of visitors with their spades. Bioluminescent beaches can crop up almost anywhere. Some plankton and algae can glow with their own light—called bioluminescence. Because it takes energy for them to glow, they only produce light in certain conditions. When these conditions are met, they can light up an entire beach. Some beaches have fairly regular bioluminescence at predictable times if you want to see this natural wonder. By day, the depressingly named Mosquito Bay in Puerto Rico looks a slightly sludgy brown. At night, swimmers and kayakers can see dinoflagellates scintillating with blue light, their motion provoking the organisms to light up. In the Maldives during the autumn months, when the Moon is low, minuscule crustaceans produce a blue glow to help attract mates. Because they are larger than most algae and plankton, they sprinkle the sands with tiny dots of light. Some algae and plankton produce their light when put under pressure. Walking on a beach covered in them can leave a trail of glowing footprints behind. The very least you can say about most beaches is that they are beside the sea. Gulpiyuri beach in Spain bucks that trend by being inland. It’s only 100 meters (330 ft) from the sea, but it’s still cut off from it by high rocks and cliffs. Yet as the tide comes in on the sea beyond, the sand of this hidden beach is covered by water, too. How can such a tiny body of water be tidal? The solution is a series of caves and channels that have formed in the rocks that connect Gulpiyuri to the sea beyond. The tiny beach was formed in the last Ice Age, and its name means “Circle of Water.” Gulpiyuri is sometimes called the world’s smallest beach, which may well be true. It is certainly surprising to find a beach in the middle of green field. At high tide, it is just about possible to swim at Gulpiyuri, but if you want to enjoy the sand, you should go at low tide and just wade in the knee-high sea. When the tide goes out, beaches become great places to walk, run, or play sports on the sand. It’s still nice to hear the sea nearby, though, to remind you where you are. In Chandipur in India, twice a day with the low tide, the sea entirely disappears. Due to the unusually flat seabed which comes up to the shore, the low tide makes the sea recede by up to 5 kilometers (3.1 mi). The huge expanse of sand is used by locals and tourists for walks, bike rides, and even car journeys all the way out to the now-distant ocean. The exposed seabed is also rich in red crabs and other sea creatures, which twice a day find themselves gawped at by humans as they are cut off from the sea by kilometers of sand. The sight of the disappearing ocean is being used to attract tourists to the area. Just be sure you know the tide times, or you might find yourself suddenly 5 kilometers out at sea. Searching out seashells on the beach can be a good way to get children to pass the time. On Shell Beach in Australia, however, you should probably set them to the task of finding something other than seashells. A 70-kilometer (43 mi) stretch of the coast is covered in a layer of cockle shells up to 10 meters (33 ft) deep. Trillions of cockle shells have built up in the area over the ages. The tide will eventually break them down into fine, sandy particles, but for the moment, the shells remain intact. In the past, locals mined the shells to turn them into building materials, though the beach is now a World Heritage Site and used for tourism as opposed to construction. The area also has hypersaline water. The extra salt makes it easy for visitors to float. Usually the last thing you want to see on a beach is broken glass. Some places, however, owe their uniqueness to the thoughtlessness of humans. Fort Bragg, California, has a beach covered in sparkling pebbles of sea-polished glass. For decades, the local communities dumped their unwanted goods, even cars, beside the sea. While organic things decayed, and metal either rusted or was taken away, broken glass built up and was tumbled by the waves into smooth lumps. The beach now is protected by law, and the iconic glass cannot be removed by visitors. Other places around the world also have high concentrations of sea glass thanks to dumping by people. Ussuri Bay in Siberia is home to glassmaking factories which dumped their mistakes into the sea. Now, the beach is a colorful mix of stones and sea glass. What could be more romantic than walking hand-in-hand with your loved one over a gleaming, white, sandy beach? Maybe you lie in the sand and let it run through your fingers and muse on where so much beauty came from. Few people would imagine that all the dazzling sand around them is the product of fish poop. Parrotfish live in reefs and feed by gnawing on the coral. The fish are after the algae that live on the reef and cannot digest the calcium carbonate their hard beaks break off to get at them. Teeth in the fishes’ throats crush the tough calcium carbonate, and when it passes out of the digestive tract, it is fine like sand. A single parrotfish can produce up to 360 kilograms (800 lb) of sand each year. Multiply that by thousands of fish and thousands of years, and you get those highly sought-after white beaches. New Zealand’s amazing natural landscape has made it a favorite location for filming fantasy movies, as it has sights found nowhere else on Earth. Dragon Egg Beach may sound like something out of Game of Thrones, but it is a real place and a popular tourist destination. There is a stretch of Koekohe Beach that is dotted with large, spherical boulders. These Moeraki boulders formed 60 million years ago from concretions of mud, clay, and calcite. The boulders formed underground and thus were not smoothed by the motion of the waves. They have only recently been washed out of the cliffs above, from which they roll down to the beach. The boulders are full of erratic cracks, which, once exposed, can break open to give the boulders the look of hatching eggs. Local Maori legend has the boulders being formed when they first sailed to their new home. One of their canoes was wrecked, and as it sank, baskets and gourds were thrown overboard. The hull of the canoe became the reef that surrounds the beach, while the jettisoned goods became the Moeraki boulders.